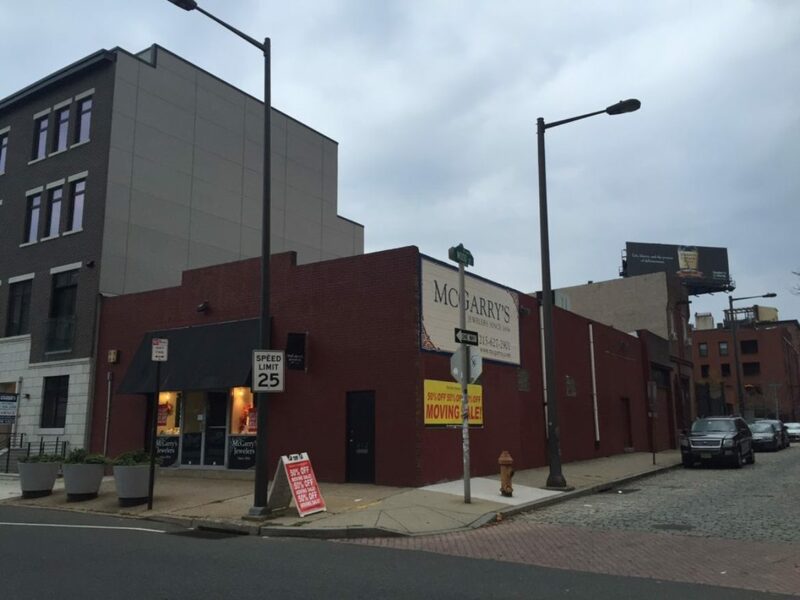 Raise your hand if you've walked or driven past McGarry's at 2nd & Wood a hundred times over the years and assumed it was an Irish pub despite the signage clearly showing that it's a jewelry store. Uh, that's us raising our hand too. So yeah, McGarry's is a jewelry store and they've been doing their thing since 1854. And now, according to a sign on their storefront, they're moving out of their Old City location. We called them yesterday and they told us that they're consolidating their operations to their Collingswood store, which opened a few years back. So what's next for this location? It appears that the owner of the store owns the bricks and we'd wager that they're fixing to sell the property to the developers that built the Baldwin Luxury Townhomes immediately to the south. After all, much of this project has gone up on land that was previously the McGarry's Parking lot and with a couple of the homes already selling for almost $1.5M, it's a no brainer to build a couple more. If you're interested, one of these homes is currently listed for sale, for $1.45M. Of course, that's not all the construction we've seen on 2nd Street in the last couple of years. On the left of the image, we see three high end homes that were built at the corner of 2nd & Vine. And in the distance, you can see the new building at 2nd & New and the Bridge on Race Street just past the Ben Franklin Bridge. Somehow, nobody much minds being so close to some I-95 overpasses. Assuming that the McGarry's property sells and gets redeveloped as residential, we wonder whether such immediate proximity to the overpasses might drag down the sale prices just a tad. Then again, given just how much people seem to be willing to pay to live in this part of Old City, it might not make any difference at all. Grad students aren’t going to drop that kind of coin when you can live in West Philly. It’ll be rich undergrads or working stiffs. As long as its occupied, can’t complain too much. Awesome news! Market Street is going to be completely transformed in the next 10 years. It’s difficult (not to to mention expensive) enough to procure a monthly parking spot in this area if you work inside any of the dozens of office spaces surrounding this block. If you look at this lot during the day it is packed. How about first we find a parking solution before we make the waiting lists for the surrounding parking garages even longer. I hope this building comes with a garage for its residents. Parking is not a high tax revenue land use, so it does not and should not get any consideration besides being considered a blight use. I’d recommend public transit.